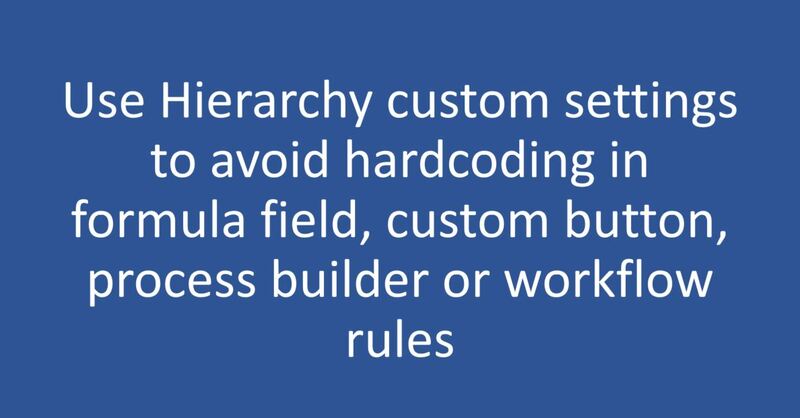 To create Hierarchy custom setting, navigate to Setup | Custom Settings | New. If you want to see action first, then below Youtube video is all yours. Again, don’t forget to subscribe my Youtube channel for latest videos related to Salesforce. 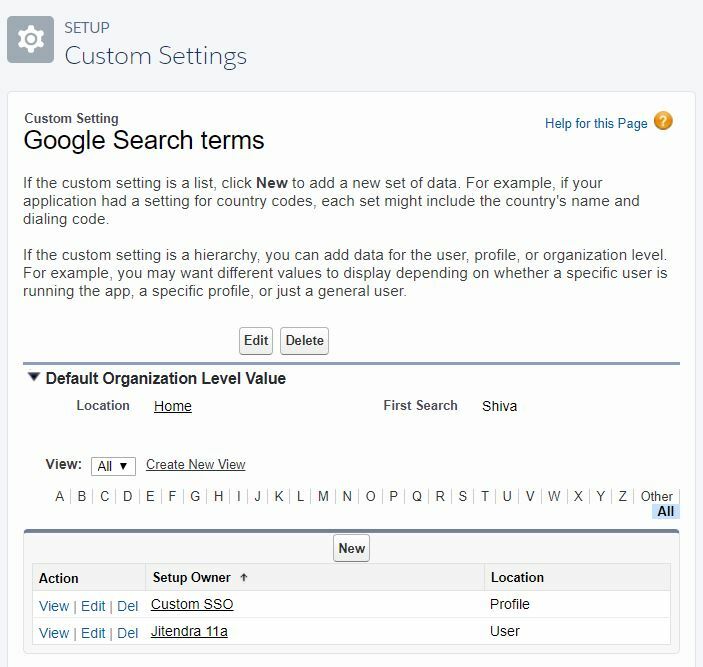 For this article, we are considering below custom setting which contains information about default search word for Google. 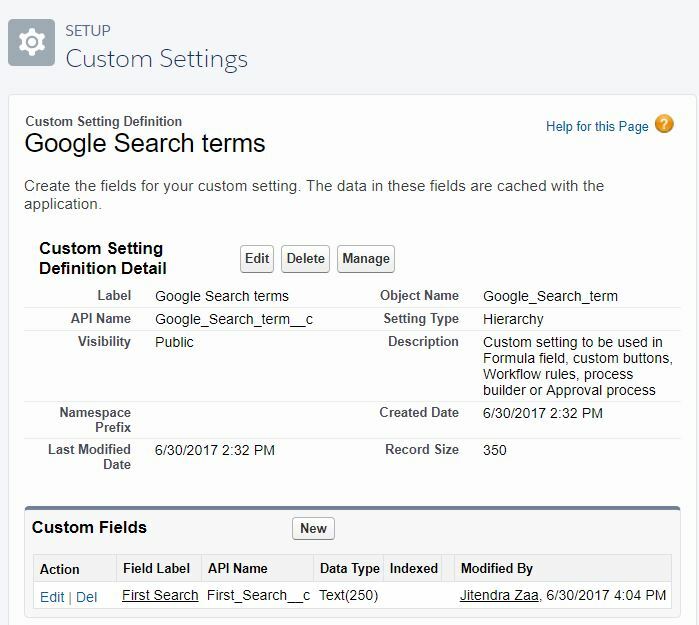 Custom setting name is Google_Search_term__c and field name is First_Search__c. To add value in custom setting, click on Manage.As shown in below image same field First_Search__c in custom setting has different values at Organization level, profile level and user level. 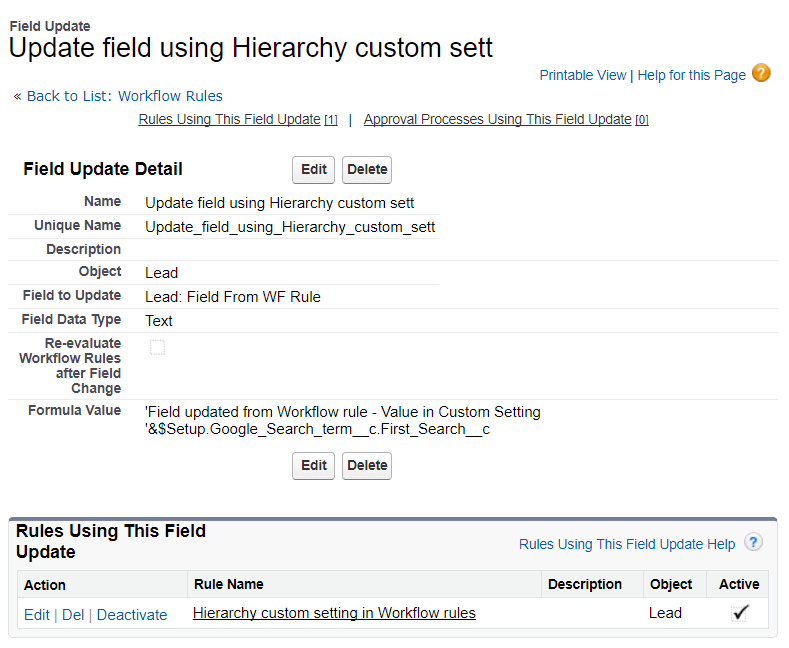 First example we will see is using Hierarchy custom setting in formula field. Let’s assume, we need to create a hyperlink formula field to search Google on basis of value available in hierarchy custom setting. In this case, running user is Jitendra Zaa and profile is System admin. As per above data, logged in user does not have any value defined at user level or profile level, therefore Organization level value would be considered. Above formula is deriving a Google search URL. On URL click, it will open Google search page with default search text as Shiva. 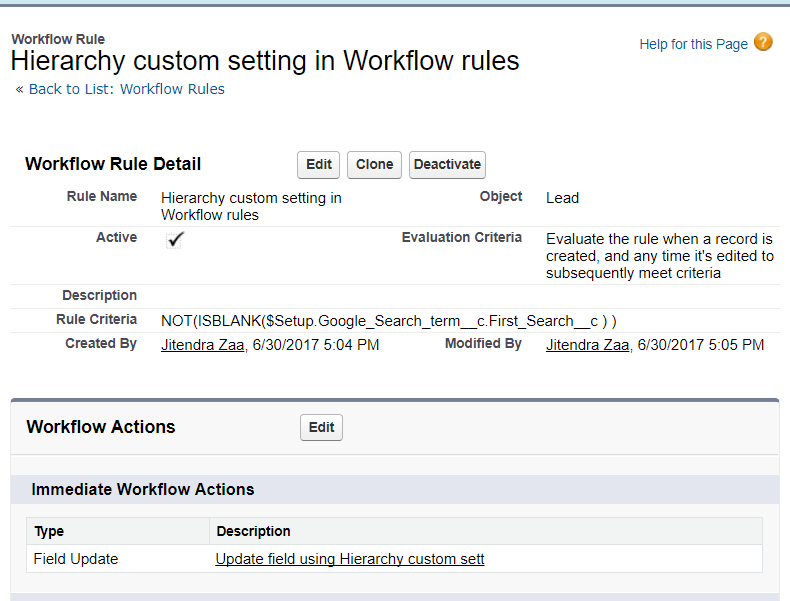 We can use Hierarchy custom setting in process builder either to define criteria or in action. Below image shows custom button using Hierarchy custom setting. Hi. I’m not getting the part about “When sandboxes are refreshed or metadata deployed to different instances, admins would need to change values manually.” This is still going to happen, no? If i refresh from prod to a dev sandbox, then the org-level values in dev will be overwritten with the prod ones, and we’ll have to enter dev values again. I’m asking because I’m looking for the best way to keep different org-specific values, like callout endpoints. And, also have them available from custom buttons. 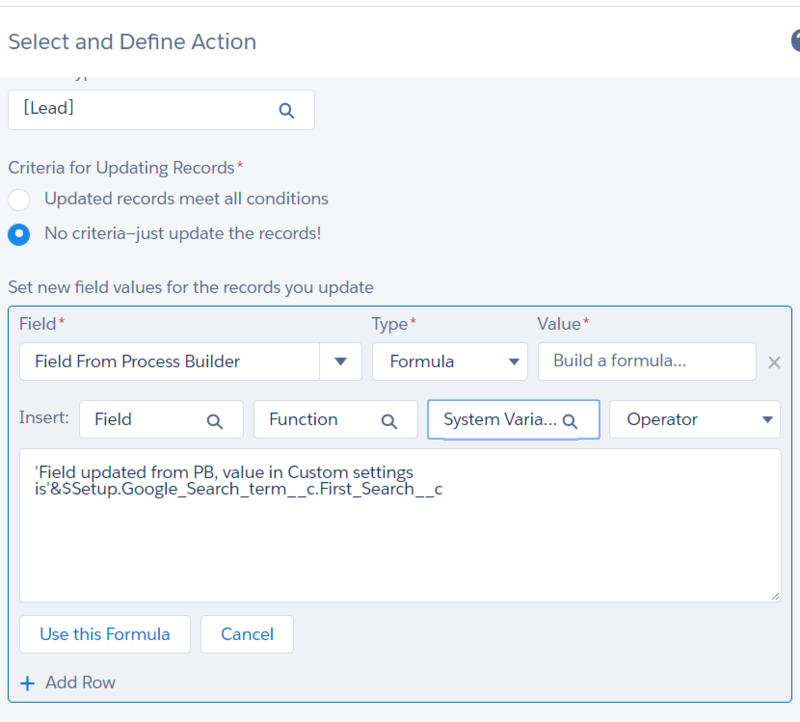 Hello Julio, when sandboxes are refreshed the production custom setting values are pushed down from the production instance to the sandboxes. 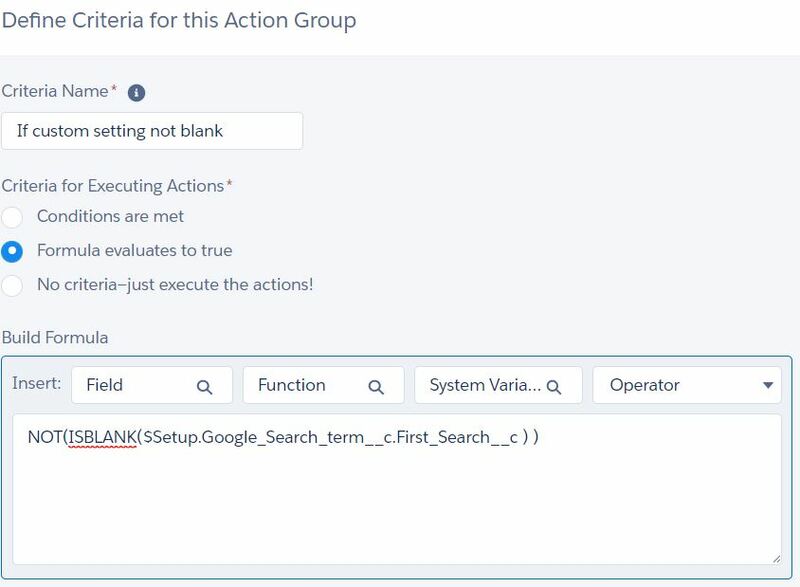 Use custom settings and have a data operation that updates the settings to location specific endpoints. Just envision backing up your custom settings and then restoring them after the sandbox refresh in your dev / testing instances.. Hope that helps..
Hi,,, Can we use custom settings in Triggers ?